And me, I haven't even started yet! But on july 1, I went to my brother's for dinner and yesterday I had dialysis and that wiped me out as it sometimes does. I will try to get started today, though. I may try to start with a few shorter films...I may kick off my marathon with the one Audie Murphy movie I have I haven't got around to watching yet...it's a mere 77 minutes long! Hey, I wonder if Jonah Hex is still around? My marathon would be one excuse to see it...though I hear it is one horrible film! This was my second viewing of Up and it just got better, at least the dramatic parts, since upon second viewing it is much clearer how everything fits together. Black Narcissus watched and reviewed. 6 down, 21 to go. I wasn't quite sure what to make of this but I wanted to get me a real "Z" movie I could include in this year's A-Z marathon...and so I chose this one! What else would I choose? Zombie High? Zuma Beach? I guess it came down to this, Zombieland or Zulu Dawn. Since I like comedies and I like both Tim Allen and Courteney Cox, I decided to get this one...besides, Courteney doesn't make many feature films, does she? This started off strangely enough and it took me awhile to figure out just what was going on. 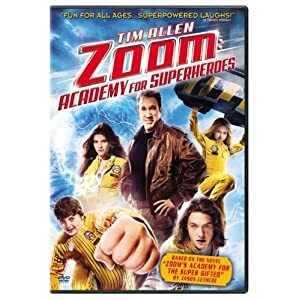 I soon gathered that Tim Allen's Jack Shepherd was a former super-hero who had lost all his powers but this secret government group wants him to guide a new bunch of young super-heroes (from a 6-year old girl to teenagers). There's this guy in there that was a weird-looking version of Chevy Chase...then I realized it WAS Chevy Chase! The film has an odd look to it's cinematography...going for that comic book look, I guess. Overall, I didn't hate the movie, but I didn't love it either. I guess I'm somewhere in the middle of this. I'll give it a I guess. Maybe I'll like it more the next time? Carnal Knowledge watched and reviewed. 7 down, 20 to go. I watched 3 more today...well...on the 3rd. I'm working on getting reviews posted here for them now. I am going to be staying at my friends house for the next couple of days so I won't be on much. I will be watching movies, for example, we just finished watching New Moon but I won't post the reviews until I get back home, but when I do I will add them to my alphabet marathon. I will post the date I watched it though, not the date I posted the review. M for M! and The Fountain for F.
I just hit double digits... and watched movie #10 this morning! I'm spending the holidays watching my team lose again...I'll watch at least one movie today afterwards. Could it be...a western??? I think I'm up to 7. I intended to watch at least 2 last night, but it didn't work out that way.